Is it hard to believe that musicians don’t fail because of their music? Most musicians that have extensive training in their craft do not lack creative ability or talent, despite how self-critical or perfectionist they may be. They may have untapped potential in the areas of business and marketing, however. Ask any skilled musician. Once you’ve achieved a certain level as a vocalist or instrumentalist, it gets harder and harder to take things to the next level. In other words, your proficiency only grows marginally after a certain point. To go beyond your current level might require days, weeks, months, or even years as opposed to seconds, minutes, or hours. Just because it’s hard work to keep growing, this doesn’t mean you shouldn’t continue to improve as a singer or instrumentalist. What it means is that you have other untapped skills that have plenty of headroom for improvement. If you could improve your business sense by two or three points on a 10-point scale, you could achieve much greater things in your career. Does that sound unrealistic? Take a look at the following graph. 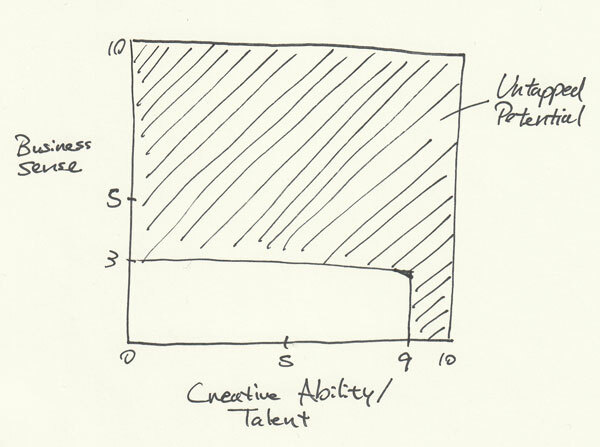 If you would rank your talent, creative ability or skill level at a nine, and your business sense at a three, your untapped potential is over 70% of the entire graph! Even if you managed to inch closer to a perfect 10 in your creative ability or talent (arguably, there is no upper limit), you can only increase your territory by a smaller percentage of the graph. Therefore, the better way to reach your full potential is to increase your business sense, your entrepreneurial skills, your leadership ability. Can You Turn a Weakness into a Strength? If business is naturally a weakness of yours, you can’t expect it to one day become your strength. But you can probably still increase it by two to three points. So if you’re a five, you could become a seven or an eight. If you’re a three, you could become a five or a six. Every time you become a better businessperson by a single point, you claim another 10% of your personal potential! If you can better your people skills, you can make more connections that will aid you in your progress. After all, it isn’t about what you know, it’s about who you know. If you got better at managing your finances, you could fund more projects, go to more conferences, and open more opportunities. If you had clearly defined goals, you’d be able to break them down into smaller steps that would take you on a path towards achievement. So, I’ve just showed you how you can begin to unlock your potential. This is done by dedicating yourself to learning about business, and more importantly, applying what you learn. But I’m also a realist. Let’s say you’re hopelessly lazy, or no matter how hard you try, you can only increase your business sense by a single point. An employee works for money and other people. Business owners have money and other people work for them. This means you can surround yourself with people who are good at what you aren’t. You may never become a business magnate. Building a single business is a big enough challenge of its own. A music career is a business in its own right, but many musicians never face up to that fact. So, the best thing you can do is work with people who are strong where you are weak. Get them to help you with the business side of your career! Never stop growing. You are capable of so much more than you even realize. It’s easy to become complacent and never push for change. It’s hard to keep striving towards improvement. But you won’t regret the effort you put into it. 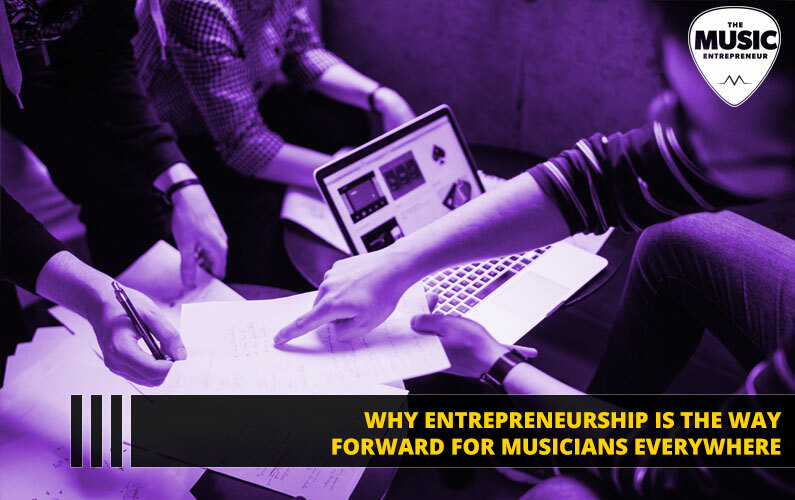 If all you do is adopt a long-term mindset and become more consistent in applying yourself to your career, you’ll be miles ahead of where musicians are. 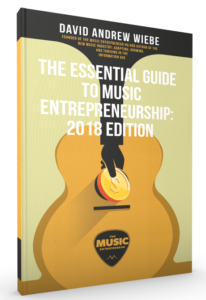 And now you understand the importance of entrepreneurship in building a music career in the digital age. What are you planning to do to keep improving? Let us know in the comments below!